Abstract: Aldrovanda vesiculosa, a critically endangered aquatic carnivorous plant, is a species rapidly vanishing from Europe. A map of its recent European distribution is given. Of its earlier distribution area covering a substantial part of Europe, only a few native sites in Hungary, Poland, Romania, Russia and Ukraine remain. On the basis of the literature, field research in Aldrovanda habitats, and experience of its cultivation both in culture and in the field, its ecological requirements and habitat characteristics are reviewed. The most important requirements appear to be a high CO2 concentration, a medium concentration of humic acids in the water, warm water of high transparency, and a very low biomass of accompanying aquatic plants. The possibility of forming new substitute localities of Aldrovanda is discussed. 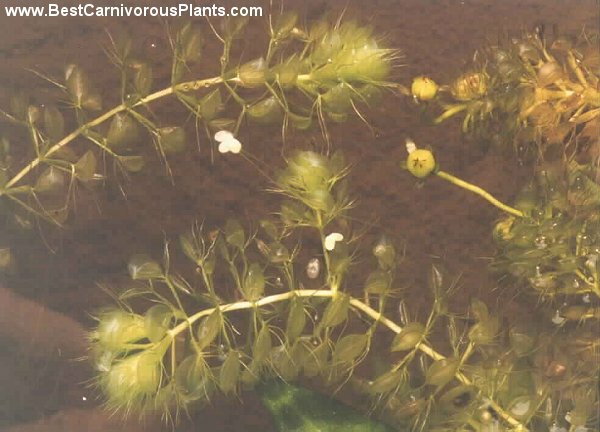 Aldrovanda vesiculosa L. is a rare aquatic carnivorous plant. It is rootless, free-floating, growing close below the water surface in shallow standing waters (Fig. 1; LLOYD 1942, BERTA 1961, CASPER & KRAUSCH 1981). It is considered to be strictly stenotopic (e.g. WALTERS 1979, STUDNIČKA 1984), its competitive ability appears to be very low and its occurrence, therefore, is always sparse and irregular (BERTA 1961 ). Aldrovanda forms loose, species-poor, communities, some of which can be assigned to Spirodelo-Aldrovandetum (BORHIDI & JÁRAI-KOMLÓDI 1959). It overwinters in the form of turions. The species has undergone a marked reduction in the number of occurrences through the past several decades. This, together with the very sparse nature of its distribution, makes the species an interesting object of ecological studies. Still, the ecology of A. vesiculosa has hitherto been little studied. Older references, between 1850-1960, include mainly botanical descriptions of the species and habitat, phytosociological characteristics of habitats, and its phytogeographical distribution (for a review see LLOYD 1942, BERTA 1961, WALTERS 1979, STUDNIČKA 1984, DEGREEF 1986). Recently, KAMIŃSKI (1987a, b) studied plant fitness in relation to water chemistry characteristics in ten Polish sites of A. vesiculosa and also its growth and developmental characteristics in laboratory experiments. He studied the effects of pH, nutrient concentrations, humic acids etc., together with ecological processes like carnivory. The aim of the present paper is to review the literature on the ecology of A. vesiculosa, report on the unpublished field research conducted at natural sites and experience in its outdoor cultivation. This will help to elucidate its principal ecological requirements necessary for vigorous growth and, consequently, successful persistence at the site. A map of its most recent known European distribution is also presented. Fig. 1. Aldrovanda vesiculosa plants with abortive capsules cultivated in an outdoor culture in the Botanical Garden of the Wroclaw University, Poland. Photo by R. Kaminski. The life form and growth strategy of A. vesiculosa is similar to those found for the aquatic Utricularia species and predetermines some of its ecological requirements. The principal feature of A. vesiculosa is its permanent apical growth at the growing end together with gradual aging and decomposition at the basal end. Aging of the basal part can be accelerated considerably by covering the shoots with periphyton, to which Aldrovanda is very susceptible (MAZRIMAS 1978, STUDNIČKA 1984). Aging is also increased by the sedimentation of suspended particles or the precipitation of tannins on the shoots (field observation; ADAMEC, unpubl.). Very fast apical growth is therefore necessary to overcome these unfavourable conditions. Under optimum conditions, its daily growth is as fast as 1-2 new whorls a day (LLOYD 1942, STUDNIČKA 1984). For such fast growth and successful competition with algae and aquatic vegetation, Aldrovanda requires several ecological factors to be at an optimum (CO2 concentration, humic acids, high temperature, enough prey, etc.). Considering these conditions and its low competitive ability, it may be classified as a stenotopic species while it behaves as a eurytopic species with respect to other factors (e.g. carbonate hardness, concentration of some nutrients; KAMIŃSKI 1987a). Flowering of the European ecotype of A. vesiculosa is extremely rare, the plants bear abortive seeds and reproduce vegetatively by apical branching of the shoots (Fig. 1; BERTA 1961, KAMIŃSKI 1987a). A high frequency of branching is therefore a good criterion of the suitability of its growth conditions (KAMIŃSKI 1987a). Fig. 2. The recent European distribution of Aldrovanda vesiculosa. Full circles, recently verified records (see Appendix for comments); empty circle, introduction. The number at the symbol indicate the number of sites in the region. All islands, Scandinavia, and a part of Russia were omitted for simplicity. A, Austria; B, Belgium; BE, Belarus; BG, Bulgaria; CH, Switzerland; CZ, Czech Republic; D, Germany; DK, Denmark; E, Spain; ES, Estonia; F, France; GR, Greece; H, Hungary; I, Italy; LA, Latvia; LI, Lithuania; M, Moldavia; N, The Netherlands; P, Portugal; PL, Poland; RO, Romania; RU, Russia; SK, Slovakia; T, Turkey; UKR, Ukraine; YU, former Yugoslavia. A. vesiculosa occurs irregularly and rarely from tropical to temperate zones in Europe, Asia, Africa, and N Australia. Most historical records from Europe are from Poland, S Germany, N Italy, the Balkans, Ukraine, and S Russia (BERTA 1961, WALTERS 1979, CASPER & KRAUSCH 1981, DEGREEF 1986). However, a marked reduction in the number of sites has occurred during the last 30 years (WALTERS 1979, KAMIŃSKI 1983). This decline has been caused mainly by water eutrophication, drainage, and the filling in of water bodies (WALTERS 1979, KAMIŃSKI 1983, STUDNIČKA 1984). Other reasons may be recreation, motor boats, and more general land-use changes, particularly afforestation and intensive agriculture (AYMONIN 1982). Besides the obvious reasons, high concentrations of NO3- and SO42- ions in acid precipitates may play a negative role in the eutrophication of its sites, without any other apparent external reasons. Even so, a recent definitive list of European sites is lacking, and it is possible that Europe (excluding the former Soviet Union) does not have more than twenty sites left (see Fig. 2), with possibly a few dozen sites in Ukraine and Russia. It has been assumed that A. vesiculosa can be spread by waterfowl, but the means of spreading remains unknown (BERTA 1961, STUDNIČKA 1984). However, it may also successfully inhabit new habitats either after introduction or spontaneously (WALTERS 1979, GORBIK & KLOKOV 1985). Obviously, knowledge of the ecological requirements of A. vesiculosa is vital for the selection of potential new sites. The most recent list of the European distribution of A. vesiculosa has been published by WALTERS ( 1979) and DEGREEF ( 1986). However, owing to their lack of new data, the list was based on older data provided mainly by BERTA (1961). The present list has been established on the basis of recent references, where possible, but mainly from personal communications provided by hydrobotanists from several European countries (Fig. 2). For detailed comments to the distribution map see Appendix. The ecological requirements of the European ecotype are given in order of apparent importance. However, the requirements are usually interrelated, some are direct and principal whereas others are indirect. (1) Water concentration of free CO2 (denoted henceforth as CO2) should be relatively high to support a high growth rate. It is generally accepted that CO2 concentration is a limiting factor for the photosynthesis and growth of aquatic plants which are not able to use HCO3- (e.g. MADSEN & SAND-JENSEN 1987, SAND-JENSEN 1987). As a result of decomposition processes in peat, a high CO2 concentration usually occurs in peaty waters (up to 0.78 mM; PAFFEN & ROELOFS 1991) or in tropical dystrophic waters with an organic bottom (0.2-1.5 mM; HORST 1976). Also, in five stands of Aldrovanda in E Poland, a very high CO2 concentration within 1.1-3.5 mM was found at the plant level (ADAMEC, unpubl.). CO2 concentration was calculated from field pH measurements and the values of carbonate hardness. Similar values may also be deduced from the literature (STUDNIČKA 1984, KAMIŃSKI 1987a). It was found in "light-bottle" experiments that Aldrovanda was a typical HCO3- non-user and its CO2 compensation point of photosynthesis was 5.9-7.2 microM. Furthermore, a laboratory study revealed that its photosynthetic rate declined steeply at CO2 concentrations below ca. 0.1-0.15 mM (ADAMEC, unpubl.). From the values of CO2 concentrations at its sites, photosynthetic characteristics, CO2 concentrations measured in outdoor cultivation, and field growth experiments in nylon enclosures on selected sites (ADAMEC, unpubl. ), it follows that the optimum CO2 concentration may be within 0.5-2 mM, or at least a minimum of about 0.1 mM. In this respect, the pH value itself is not of primary importance, as often previously stated, while CO2 concentration is (cf. MAZRIMAS 1978, KAMIŃSKI 1987a). (2) A certain (medium) concentration of humic acids of about 1-6 mg C.l-1 must necessarily be present in the water, the optimum being 3-5 mg C.l-1 (KAMIŃSKI 1987a,b). Thus, water must be dystrophic. KAMIŃSKI (l987b) found experimentally that humic acids affected the growth and development of Aldrovanda considerably. (3) A high biomass of dead and partly decomposed plant litter (of Carex, Phragmites, etc.) should occur on the bottom of stands. This was found in the majority of Aldrovanda sites (e.g. BERTA 1961, STUDNIČKA 1984, FŰRST 1986, KAMIŃSKI 1987a). The litter releases CO2 and humic acids and decreases the pH value. As the result of a low decomposition rate of the litter, the majority of mineral nutrients are bound in the litter. (4) At the water surface, the stand must be free of a dense biomass of submerged and floating plants and of dead plant matter. Owing to its a very low competitive ability, this requirement has often been connected with its ability to form dense stands (AFANAS'EV 1953, BERTA 1961, STUDNIČKA 1984). However, a loose stand of Phragmites, Typha or Carex is very favourable for its growth and apparently represents its ecological optimum (AFANAS'EV 1953, BERTA 1961, STUDNIČKA 1984, GORBIK & KLOKOV 1985, FŰRST 1986, KAMIŃSKI l987b). This could be related to litter production and the suppression of algal growth due to shading or release of tannins. (5) Aldrovanda stands should be almost fully irradiated by the sun to produce both high light conditions and high water temperatures (e.g. AFANAS'EV 1953, MAZRIMAS 1978, STUDNIČKA 1984). An accompanying tall emergent vegetation (Phragmites, Typha, Carex) may reduce the irradiance to only about one-third of that in the open (MAZRIMAS 1978; field observation and growth experiment; ADAMEC. unpubl.). Greater shading than this is unfavourable. (6) Water at the site should be relatively transparent. Based on cultivations and field observations, a very low biomass of phytoplankton and filamentous algae (e.g. MAZRIMAS 1978, STUDNIČKA 1984) and a low amount of fine suspended matter (AFANAS'EV 1953; field observations; ADAMEC, unpubl.) should prevail in the stand. Phytoplankton and filamentous algae significantly reduce the CO2 concentration in the water and compete strongly with aquatic plants (MABERLY & SPENCE 1983, PHILLIPS et al. 1978). (7) During much of the growing season (May-September), water near the surface should be relatively warm, at least above 16 °C, with an optimum of 23-26 °C (LLOYD 1942, MAZRIMAS 1978). A high temperature is necessary for fast growth. (8) The major part of each cite should be shallow to within 0.1-0.6 m (cf. AFANAS'EV 1953, BERTA 1961, STUDNIČKA 1984, GORBIK & KLOKOV 1985, FŰRST 1986, GRAMSZ & JASIŃSKA 1986), with an optimum of about 0.2-0.4 m. Shallow water makes rapid warming of the upper water layer possible and speeds up the CO2 flux from the bottom to the water surface. (9) The stand should be rich in zooplankton (e.g. MAZRIMAS 1978, STUDNIČKA 1984). Feeding on prey markedly enhanced plant growth (KAMIŃSKI l987b). (10) A medium-high concentration of main nutrients (NH4+, HPO42-) in water should occur (mesotrophic water; STUDNIČKA 1984, KAMIŃSKI 1987a,b) since too high a nutrient concentration promotes algal growth. The plant does not have a special requirement for total alkalinity (carbonate hardness) and a wide range between 0.1-5 meq.l-1 is suitable (KAMIŃSKI 1987a; Swiss and Polish sites: ADAMEC, unpubl.). (11) Aldrovanda sites must not be flooded otherwise the majority of adult plants and turions may drift away from the stand. Equally, during the growing season, the water table at the site should not decline markedly as a greater part of the population may be desiccated. Lowering of the water table in winter may not present a high risk to turion survival (STUDNIČKA 1984, GRAMSZ & JASIŃSKA 1986). (12) Where a higher biomass of free floating plants (Lemna, Spirodela, Ricciocarpus, Salvinia) occurs in the habitat it should not be protected from the wind (i.e. by trees) as the wind is an important factor clearing the water surface (AFANAS’EV 1953, STUDNIČKA 1984). (13) A very low oxygen concentration and strong reducing conditions (i.e. low redox potential) must not occur during the growing season. Under these conditions, fast growth cannot take place. (14) To enhance potential spreading by waterfowl, every single site of Aldrovanda should be surrounded by a chain of shallow standing waters where it could potentially grow. The distance between them may be as much several km (cf. BERTA 1961). This requirement is unnecessary for growth but contributes greatly to the maintenance and spread of its population in a given region because its occurrence within a certain habitat is often limited in time (BERTA 1961, WALTERS 1979, KAMIŃSKI 1983). It follows from the map of recent distribution of A. vesiculosa (Fig. 2) that a drastic reduction in the number of its sites has taken place in Europe within the last one hundred years. Evidently, some environmental factors (mainly biotic, i.e. competition) may vary only within very narrow limits and hence, a very small change in them may result in the decline or extinction of Aldrovanda (WALTERS 1979). The most important ecological requirements include high CO2 concentration, the presence of humic acids in the water, a water surface free of dense vegetation, high irradiance and water temperature, and the low competitive ability of other aquatic plants and algae. Recently, its natural spread in Central, Western, and Southern Europe has been virtually impossible due either to the low number of potential sites fitting its habitat requirements, or to the great isolation of existing sites (see BERTA 1961). Thus, the chances for the survival of Aldrovanda are based on the maintenance and protection of new potential sites (shallow lakes, peaty lakes and pools, swamps, shallow reed belts, etc.) and on the introduction of Aldrovanda to these sites. This has succeeded in Switzerland (FŰRST 1986), probably the last site of this species in Western Europe. Acknowledgements: The paper is dedicated to Dr. Dagmar Dykyjová on the occasion of her 80th birthday. The author wishes to express his sincere thanks to all colleagues who kindly provided unpublished information on the recent Aldrovanda distribution or the recent literature. They are: Dr. J. Bogoly, Veľké Kapušany, Slovakia; Dr. D. V. Dubyna, Kiev, Ukraine; Prof. S. M. Stojko and Dr. P. T. Jaščenko, L'viv, Ukraine; Prof. V. I. Komendar, Užhorod, Ukraine; Dr. N. N. Cvelev, St. Petersburg, Russia; Prof. V. Masing, Tartu, Estonia; Prof. J. Sarosiek and Dr. R. Kamiński, Wroclaw, Poland; Mr. C. Breckpot, Haaltert, Belgium; Dr. J. D. Degreef, Liège, Belgium; Dr. H. D. Krausch, Potsdam, Germany; Prof. G. Wiegleb, Cottbus, Germany; Mr. R. Fűrst, Gachnang, Switzerland; Prof. G. G. Aymonin, Paris, France; Dr. L. E. Friday, Cambridge, England; Prof. G. Sburlino, Venezia, Italy; Dr. M. Dinka, Vácrátót, Hungary; Dr. M. Moldovan, Tulcea, Romania, and Dr. J. Kvčt, Třeboň, Czech Republic. The author is indebted to Mr. Steve Ridgill (England) for correction of the English. Sincere thanks are also due to Dr. Laurie E. Friday for critically reading the manuscript and for valuable comments. AFANAS'EV K.S. (1953): Novoe mestonahoždenie Aldrovanda vesiculosa L. v SSSR (New site of Aldrovanda vesiculosa L. in USSR). - Bot. Žurn. 38: 432-434. AYMONIN G.G. (1982): Phénomènes de déséquilibres et appauvrissements flotistiques dans les végétations hygrophiles en France. - In: SYMOENS J.J., HOOPER S.S. & COMPÈRE P. [ed. ]: Studies on aquatic vascular plants, Oto Koeltz, Brussels, pp. 377-389. AYMONIN G.G. (1988): Connaître les plantes protégées. Région mediterranéenne. - Delachaux and Niestlé, Neuchâtel; La fédération Francaise des sociétés de protection de la nature, Paris. BERTA J. (1961): Beitrag zur Ökologie and Verbreitung von Aldrovanda vesiculosa L. - Biológia (Bratislava) 16: 561-573. BORHIDI A. & JÁRAI-KOMLÓDI M. (1959): Die Vegetation des Naturschutzgebiets des Baláta-sees. - Acta Bot. Acad. Sci. Hung. 5: 259-320. CASPER S.J. & KRAUSCH H.D. (1981): Süsswasserflora von Mitteleuropa. Band 24: Pteridophyta and Anthophyta. - VEB Gustav Fischer Verlag, Jena. CONTI F., MANZI A. & PEDROTTI F. (1992): Libro rosso delle piante d' ltalia (Red data book of plants of Italy). - Ministero dell'Ambiente, Roma. DEGREEF J.D. (1986): Aldrovanda vesiculosa. - Publication of the French Carnivorous Plant Society. DUBYNA D.V. & ŠELJAG-SOSONKO YU.R. (1989): Plavni Pričernomor'ja (Wetlands of the Black sea region). - Naukova dumka, Kiev. FELFÖLDY L. (1990): Hínár határozó (Determination key of aquatic plants). - Vízűgyi Hydrobiológia 18, Budapest, pp. 24. FŰRST R. ( 1986): Aldrovanda vcsiculosa. - Taublatt 5: 14-15. GORBIK V.P & KLOKOV V.M. ( 1985): Ekologo-fitocenologičeskie otnoščenija rosta Aldrovanda vesiculosa v Kievskom vodohranilišče (Ecological-phytosociological relations of the growth of Aldrovanda vesiculosa in Kiev reservoir). - In: BRAGINSKII L.R [ed. ]: Gidrobiologicheskie issledovaniya presnyh vod. Naukova dumka, Kiev, pp. 77-81. GRAMSZ R. & JASIŃSKA G. (1986): Nowe stanowiska Aldrovanda vcsiculosa L. w zachodniej Wielkopolsce (New localities of Aldrovanda vesiculosa L. in western Great Poland.). - Fragm. Flor. Geobot. 29 (1983): 355-359. HORST K. (1976): Cryptocorynengewässer unter die Lupe genommen. III. - Aqua Pl. 1: 5-6. KAMIŃSKI R. (1983): Aldrowanda pecherzykowata (Aldrovanda vcsiculosa) ginaca roslina w Polsce (Aldrovanda vcsiculosa - a vanishing plant in Poland). - Chrońmy Przyr. Ojczysta 8: 20-24. KAMIŃSKI R. (1987a): Studies on the ecology of Aldrovanda vesiculosa L. I. Ecological differentiation of A. vesiculosa population under the influence of chemical factors in the habitat. - Ekol. Polska 35: 559-590. KAMIŃSKI R. (1987b): Studies on the ecology of Aldrovanda vesiculosa L. II. Organic substances, physical and biotic factors and the growth and development of A. vesiculosa. - Ekol. Polska 35: 591-609. LLOYD F.E. (1942): The carnivorous plants. - Waltham, Mass., USA. LŰTTGE U. (1983): Ecophysiology of carnivorous plants. - In: LANGE O.L., NOBEL P.S., OSMOND C.B. & ZIEGLER H. [ed. ]: Encyclopedia of plant physiology, New Series, 12C, Springer, Berlin, pp. 489-517. MABERLY S.C. & SPENCE D.N.N. (1983): Photosynthetic inorganic carbon use by freshwater plants. - J. Ecol. 71: 705-724. MADSEN T.V. & SAND-JENSEN K. (1987): Photosynthetic capacity, bicarbonate affinity and growth of Elodea canodensis exposed to different concentrations of inorganic carbon. - Oikos 50: 176-182. MAZRIMAS J.A. (1978): Aldrovanda. - Carniv. Pl. Newslett. 7: 102-103. PAFFEN B.G.P. & ROELOFS J.G.M. (1991): Impact of carbon dioxide and ammonium on the growth of submerged Sphagnum cuspidatum. - Aquatic Bot. 41: 61-71. PHILLIPS G.L., EMINSON D. & MOSS B. (1978): A mechanism to account for macrophyte decline in progressively eutrophicated freshwaters. - Aquatic Bot. 3: 103-126. SAND-JENSEN K. (1987): Environmental control of bicarbonate use among freshwater and marine macrophytes. - In: CRAWFORD R.M.M. [ed. ]: Plant life in aquatic and amphibious habitats, Blackwell Scientific Publications, Oxford, pp. 99-112. ŠEVČYK V.L. (1987): Novi dani pro pošyrennja dejakych ridkisnych vydiv flory Zachidnogo Polissja (New data on the distribution of some rare species of the flora of Western Polesye). - Ukr. Bot. Žurn. 44: 38-42. STUDNIČKA M. (1984): Masožravá rostlina aldrovandka měchýřkatá (The carnivorous plant Aldrovanda vcsiculosa). - Živa 32: 173-176. WALTERS S.M. (1979): Conservation of the European flora: Aldrovanda vesiculosa L., a docurnented case-history of a threatened species. - In: HEDBERG I. [ed. ]: Systematic botany, plant utilization and biosphere conservation, Almqvist and Wiksell International, Stockholm, pp. 76-82. A single surviving habitat, Baláta-tó (lake) near Somogy in SW Hungary (BORHIDI & JÁRAI-KOMLÓDI 1959), has been confirmed recently (FELFŐLDY 1990). WALTERS (1979) quoted this site incorrectly as Lake Balaton. The distribution in Poland has been studied by KAMIŃSKI (1983, 1987a) and by GRAMSZ & JASIŃSKA (1986). Of 74 former sites, KAMIŃSKI (1983) found only 11 sites with the species still remaining. A single site in Silesia was found near Opole (KAMIŃSKI 1983). However, the population was rather weak on this site and in 1994, the species was confirmed as being extinct due to eutrophication (KAMIŃSKI, ADAMEC & PÁSEK, unpubl.). The other sites are grouped as follows: Three sites were verified in the Leczna-Włodawa Lake District in E Poland in 1993 (field observation; KAMIŃSKI & ADAMEC, unpubl.). The plant died out in Lake Czarne Sosnowickie but it was found again on a peaty shore of Lake Moszne. However, at two of these three sites, the Aldrovanda population was nearly extinct, confined to less than 10 plants in an area of less than 1 m2. The most abundant populations are still to be found in the group of five sites in NE Poland in the Augustów-Suwalki Lake District (KAMIŃSKI 1983, 1987a). This was confirmed by KAMIŃSKI & BRECKPOT (pers. comm., 1993). Another group consisting of two sites was found in the Gniezno Lake District in central Poland (KAMIŃSKI 1983, 1987a). However, in 1994, it was also confirmed as being extinct due to eutrophication and infilling of these sites (KAMIŃSKI & ADAMEC, unpubl.). GRAMSZ & JASIŃSKA (1986) revealed a group of three habitats in the Miedzychodzko-Sierakowskie Lake District near Pniewy in W Poland, where in 1979, it was growing in three small lakes. In 1994, it was found only ín Lake Ostrowo whereas it was confirmed as extinct in the other two sites, probably as a result of large fluctuations in water level (KAMIŃSKI & ADAMEC, unpubl.). In the eighties, a very abundant population was found near the confluence of the Rivers Wisła and San in SE Poland (KAMIŃSKI, pers. comm.). In recent years, Aldrovanda has been verified in some sites in the Danube delta region near Tulcea (MOLDOVAN, pers. comm., 1993). No recent information from other parts of Romania is available. Recent information is confined to a small part of the country. AFANAS'EV (1953) found the species in a shallow lake near the estuary of the River Sviri on the southeastern bank of Lake Ladoga in N Russia (at 60.5°N). It represents the northernmost extension of this species and the nearest sites are some 1000-1200 km to the south! In 1993, Aldrovanda was found to be a dominant species along a 2-km-long bank of the lake (CVELEV, pers. comm.). DUBYNA & ŠELJAG-SOSONKO (1989) state its very rare occurrence in the estuary regions of the Rivers Don and Kuban' in SW Russia but no particular site is described. Here, there is no native record (BERTA 1961). It was successfully introduced to a peaty lake in the Zurich Canton in 1908 and has been growing there ever since (FŰRST 1986). Its occurrence has been verified very recently (FŰRST, pers. comm., 1993). Only fragmentary information has been obtained on distribution. In the seventies, Aldrovanda was abundant in some lakes near Šac'k in NW Ukraine (Lakes Svytjazke, Peremut, Luky, Čorne Male; STOJKO & JAŠČENKO, pers. comm., 1993). These sites are close to the ones in the Leczna-Włodawa Lake District in Poland (ca. 30 km) and to the historical ones near Brest in Belarus (ca. 20-40 km). In spite of an extensive search in 1991-1992, it was verified only in Lake Svytjazke in 1993 (STOJKO & JAŠČENKO, pers. comm.). Recently, it was found in Lake Čachove near Ljubachyny, ca. 20 km east of Šac'k (ŠEVČYK 1987). It was found in large shallow reed stands in two reservoirs of the River Dnieper (Kievskoe and Kremenčugskoe) in central Ukraine (GORBIK & KLOKOV 1985). DUBYNA & ŠELJAG-SOSONKO (1989) mention its rare occurrence in estuarine regions of the Rivers Dniester and Dnieper and a very rare occurrence in the estuarine regions of the Rivers Danube and Južnyj Bug, but no particular site is described. There are no recent records available from central and north Ukraine (Kiev, Černihov, etc. ; see BERTA 1961) where it might still be more abundant owing to the thousands of backwaters. As a result of drainage, it is probably extinct in the Charkov region and near Poltava at the River Vorskla in E Ukraine (DUBYNA, pers. comm., 1993). Thus, it follows even from the above fragmentary data that the decline of A. vesiculosa has also taken place in Ukraine. The species has been extinct in the last site in Lacanau in SW France since 1969 (AYMONIN 1988). There is no recent site given for Germany. The last one was in the former East Germany in Lake Heege near Sperenberg, 45 km south of Berlin, and the plant had vanished by the end of the eighties (KRAUSCH, pers. comm., 1993). In the former West Germany, the last site was probably at Lake Constance near Lindau (BERTA 1961, DEGREEF 1986) where the plant was collected for laboratory use at the end of the seventies (see LŰTTGE 1983). However, it has now vanished there (WALTERS 1979, WIEGLEB, pers. comm., 1993). Probably the last site was at Lake Sibolla near Lucca. As stated by CONTI et al. (1992), its occurrence has not been confirmed since 1985 and it is now considered extinct. The only habitat was at Zelené lake near Vojka in SE Slovakia (BERTA 1961, STUDNIČKA 1984). The last verified occurrence of Aldrovanda was in 1984. It has not been confirmed since 1985 (BOGOLY, pers. comm, 1992). The reason for its extinction here was the overgrowth of the site by submerged and emergent plants, dead matter, and the decline of the water table. Aldrovanda may still occur in Belarus, Lithuania, and Yugoslavia but the recent distribution is not known (cf. BERTA 1961, WALTERS 1979, DEGREEF 1986). In Yugoslavia, it was found in a canal near Novi Sad in 1982 (Květ, pers. comm. ).